8XTS If you're going to get a Christmas tree this year, you are going to need a stand to put it in. Have your tree standing tall and proud this season with the 8'-9' Christmas Tree Stand! This stand will support almost any tree between 8' and 9' tall. It also has a 1.2 gallon water capacity so your tree will never go thirsty. 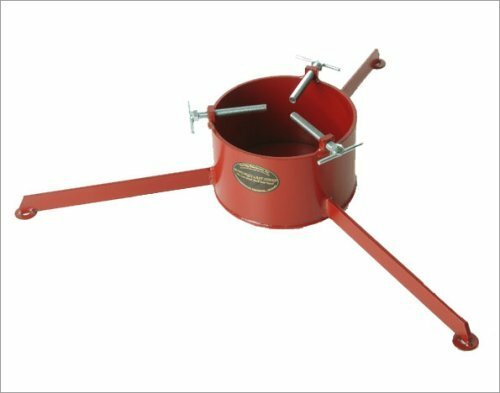 Give your tree the best home this season with the 8'' Christmas Tree Stand. Features: -Supports trunks up to 8'' in diameter. -Supports trees from 8' to 9' tall. -Holds up to 1.2 gallons of water. -Regal red color. -Unique T-bolt handles for easy tightening, straightening and easy set up. -Shipping Box Dimensions: 30'' W x 26'' D x 7'' H.
Supports trunks up to 8 in diameter. Supports trees from 8 to 9 tall. Holds up to 1.2 gallons of water.